Ed: This is Ed Sciaky here at the 2nd Fret and I'm speaking with, to coin a phrase, the very lovely Joni Mitchell. How are you doing, Joni? Ed: Very good. 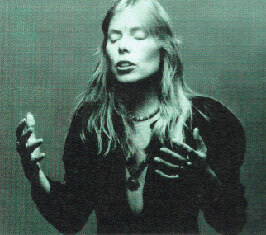 Let me take a guess: Joni Mitchell is from Saskatoon, Saskatchewan, Canada. Joni: That's right. It's amazing you can say it. Most people can't even pronounce it. Ed: Well, how have the audiences been, here at the 2nd Fret? Joni: Just lovely. I wanted to get used to Philadelphia audiences, you know, because they can really enjoy you as much as any other audience but they just don't respond as much. And every once in a while they do and it really freaks you out. Ed: Well, you kind of came from unfair advantage. Just now Joni did Night in the City; and I think, of all Joni's songs, Night in the City is perhaps the hardest to sing, for people other than Joni. Joni: Well, some parts of the chorus are complicated but when I was singing in Fayetteville, North Carolina - they have a lot of Fort Bragg types that come into the club there, and there used to be - I never even tried to make it a singalong but there used to be a sort of a chorus in one corner that would always sing along, all except for the last note which is quite a high note. But they'd do all the other part and they'd do a harmony note for the high note. So I declared it a singalong because they were singing with it, anyway. But I can't get people to do it here. Ed: Well, some of your songs like Night in the City, they have that kind of - it's almost like a yodeling type of effect when you do them, when it goes into the high part. But can it be sung in one, you might say, register? Or is that just a touch you throw in yourself or is it written that way? Joni: Oh, you could sing it in one register. It just happens that I have a split range and some of my notes I can sing with what they call a head tone the same range that I use the chest tones, which sound much lower. It's sort of like an audio illusion. I can sing the same note to you and you would say one was lower than the other whereas actually it's the same note. Ed: You almost sound like two different people. Joni: Yes, I have two different voices, two different techniques. Ed: And then you have almost a third one when you do that kind of breathy - when you sing softly in the lower register. It's almost a third voice. It's a very, very beautiful effect altogether. It's unique, I think. Joni: Oh, no. Not most of them. Some of them have tricky things. Night in the City is a very difficult song to sing. Circle Game, on the other hand, isn't difficult at all. The melody line stays pretty well on an even graph. It doesn't go jumping way up or way down. And it's been recorded by Ian and Sylvia, and Tom Rush is about to record it. He's been singing it now for about half a year. And they have no problems with it. Ed: What about recording from you? Joni: I would love to record. I'm getting excited about the idea. I'm also getting a little frightened because of what recording entails nowadays. You know, all of the beautiful things that are no longer in your hands; so you have to hire the right producer and the right arranger in order to make a record as interesting as it possibly can be. And it's choosing those people that's sort of - I'm always afraid that I won't get the right person and they won't give me the sound that I want. It's sort of out of the performer's hands nowadays. Ed: Right, and also there's the promotion that's involved if you want sales outside of a certain few that will know you personally already. Joni: Right. I could sell underground if I went with these labels that are interested in me but they're not promotion-oriented labels and so I am hoping that another company will offer something. In the event that that doesn't happen, then I will probably sign within the next six months. Ed: Very good. It's very hard, I know, to find a company that will promote efficiently. It seems that most of the albums they promote are done on a basis not of quality but on what they think they can get out of it. And there are many fine folk recordings on small labels that just never get promotion. Joni: Another thing, too, is that - see, I am not really in a trend. I'm not a group, which is the current recording trend. Everybody picks up on groups and singles are having a hard time of it, you know? So there is that difficulty, because I've excited a couple of people in the record companies who say, "Wow, I really like you but I can't put you in a category." Which they seem to think is a bad thing and yet that's what I've been striving for, for a long time, is not to be categorized. And yet they would rather if they could type me. And they can't really type me as a folk singer any longer, aside from the way I look when I do a personal appearance. Ed: So what is known as a folk singer now is a very ambiguous term. Ed: Do you consider your music in the folk idiom, though? Ed: Yeah, a beautiful song. Joni: -- is a rock song. Joni: I would say so. Don't you hear it as a rock song? Ed: I have to listen for it again. Joni: More than a folk song. Joni: It doesn't have the feel of a folk song. Ed: It sounds better than most folk music I've heard. Your songs in general sound - you know, they're very, very melodious. The Circle Game is a beautiful song - and Night in the City. Night in the City, I think, sounds like a rock song. Ed: Do they have an odd name like the Peanut Butter Conspiracy or something like that? Ed: Well, then, I don't think you ought to pick them. You know, these days. Actually, what you ought to do is make up a name for yourself - and triple-track your voice and rock it up and sell a million records and not tell anybody that it's you. Ed: And then come along and say, "Look, here I am." Joni: Like this fellow, Egbert Humperdinkel, or whatever his name is. Joni: Yes. Such a beautiful-looking person and this terrible name. Ed: What about Brute Force? Joni: Is there really such a person? Ed: I think there is. He records for Columbia. He has an album called I, Brute Force. Ed: Well, it's only one person, though. The names, though, of groups are getting really, really wild. Joni: Yeah, I like some of them. Ed: Tom Rush recorded your song, Urge for Going. Has it been a pretty good hit? Joni: It did fairly well. Elektra, of course, isn't a promotional-minded label. It did very well in the Boston area and in New York. I think it was in the top ten in both areas. Ed: What about another recording? Joni: It's been re-recorded by George Hamilton IV and he's doing marvelous things with it. It was produced and arranged by Chet Atkins so it's musically quite tasteful. And it's more the -- Tom sings Urge slower than I do, which means you have to edit it - cut out a lot of verses, to get it down to a single time. But he's left practically everything intact. He's left out a couple of lines, which I don't really even miss, the way they've been left out. As soon as it gets into the top ten RCA is going to promote it into the pop charts, where it's already getting a lot of play because it is more pop than country. It's not a country song in the first place and the arrangement isn't very country-ish. Ed: Well, the way you say "promoted into" the top ten - you kind of draw the line, then, between what you want for yourself in the way of promoting yourself as a singer and the idea of getting your song pushed and played and, more or less, the commercial end of the record business. Joni: Oh, it's two different hats. You see, I have my own publishing company. So, from the publisher's point of view, I'm excited that one of the songs in the catalogue is doing well. They're going to do what they call a crossover when a song changes fields. Like, I don't know, there have been some songs like Running Bear Loves Little White Dove - do you remember that crazy thing? Joni: Well, that was a country song that jumped over into the pop charts and they're hoping they can do the same thing with this recording. And I think, with the proper promotion that RCA can give it, that it will do that. Ed: But that's RCA's decision now, what they want to do. Is that it? Joni: As soon as it's in the top ten they begin a new campaign with ads and billboards that says things like "just in from the country" or "those Nashville cats are at it again" or something tricky like that. Ed: I was looking at a lead sheet of The Circle Game, I believe, and the lyric didn't exactly match what you were singing. Do you change your songs? Joni: The way I sing Circle Game, it has evolved. The way Tom sings it and the way Ian and Sylvia sing the song is the same as it is on the lead sheet. Now, I changed it because I, at one point, went to Chicago and cut it as a single. I was going to try and have somebody buy up the rights and promote it. It didn't work out well because Circle Game is not ever going to be a rock-and-roll song. Ian and Sylvia found that out with their version of it and I tried to do the same thing. It has to be kept down. It has to be a ballad, and it's very tempting. So, in the process of rocking it up, I had to eliminate a couple of choruses; and when you put a verse back to back, then the melody became tedious, so I did that, "So the da-da-da-da-da-da-da - So the years spin by and now the child is twenty - the boy is twenty." That's one change. Ed: What was it in the original? Joni: Um, so - oh, I can't even remember it. I've been singing it that way now for half a year. I can't remember what it was. Listen to the Ian and Sylvia record and the way Tom does it. That's the how it used to be. Ed: I noticed on the Ian and Sylvia there is a noticeable - at least for me - break where, you know, they leave out a chorus. It seems like they should go into the chorus of it and they just go into another verse and it seems like something is left out. Joni: Well, I think they originally tried to make that into a single because they've got it under three minutes, which they don't need to do if it's just going to be an album cut. To get it down to single length, you have to cut out all but two choruses, because they are long choruses. It runs about four or five minutes, the way I do it, with all the choruses left in. And you can't crop any verses, you know, because the song's chronological. Ed: The recording you made, was that just a private recording or was it done for a company? Joni: It was private. It was done by a production company called Lorien, which is also sort of a partner of Gandalf, and it's just being used as a publisher's stub. We send it out every once in a while to people who would like to record the song. Ed: Where do you go from here? Joni: I go to Detroit. I open Tuesday of next week in the club called The Living End there; and then I have, oh, about three weeks around with just local concerts and things in the Detroit area and then I go to Boston to the Club 47. And then I begin the southern tour again: Fayetteville, North Carolina, and Charleston, South Carolina. Ed: There's an army - what is it, Fort Bragg? Joni: Fort Bragg. It's Fayetteville. It's a wonderful club to work. Ed: It's just the army base there. Ed: Is that it? There's no town. That's it. Joni: Oh, no, there's a town. Joni: It draws mostly army people because it's the only club in town that they serve beer on tap and it's the only place in town where a service man can take a girl that's a decent bar. Most of them are very rowdy because of the service and things being there. Ed: This is a more or less suburban kind of a town, then, isn't it? Ed: It's a pretty small town; it's not in the main metropolis. Have you found in the United States that there are lots of small towns like this that like folk music? Joni: Oh, very much so. My favorite club to work, where I go after Detroit, is a place called The Sipping Lizard in Flint, Michigan. And it's just a small town and it's just a small coffee house that began with this family's sons being interested in folk music and having friends over on the weekends, and soon they had 150 kids in their basement - and Jackie, the mother, had to start charging them admission because they were eating her out of house and home. So they moved the club into a pool hall. And it's marvelous, it really is - the enthusiasm. And the thing that's great about it is the age breakdown, because you get college professors and you get young kids and you get whole families. I had one little girl come toddling up to me one night and she was part of a family that ranged from five years - there was a five-year-old girl, a seven-year-old girl and a nine-year-old girl and then the mother and the father - and the nine-year-old came up to me and she said, "Would you play The Urge For Going?" And I looked at her and I said, "Well, how do you know that song?" She said, "Oh, well, I'm learning it on the guitar." So the whole family is taking guitar lessons; and the fellow who's teaching them guitar is a friend of mine, the son of the club owner, and he's teaching them how to play all my songs in the open tunings and things, the way I do it. So I have a following from seven to seventy in Flint. Ed: That's great. It's a great way to spread your fame, having little kids playing your songs. Joni: Oh, I love it. Yeah, it's really fun. Ed: How would you rate - you said you rated Philadelphia audiences as good but not really responsive - how do they compare to other audiences throughout the country? Are other audiences just more responsive than Philadelphia's? Joni: Every town is different. Fayetteville, of course, because I'm a girl and the audience is mostly all army types, is a very enthusiastic audience, you know. Like, we had people - well, my husband Chuck, too - they were also very enthused about him and they used to give us standing ovations after every song and things, after we'd been there for a while. But that was very openly responsive. Here, I think that the people are just as appreciative - and you're always warned before you come to Philadelphia that Philadelphia audiences are really hard to play to - I don't think that it's that. It's just that you have to set a different standard because they really aren't, as a rule, as responsive as audiences in other cities. And yet, someone will come up who sat deadpan all the way through your show, after the show, and say, "Wow, I really enjoyed it." So you just have to take it into stride. Ed: Is this because Philadelphia is such a big city that the people are more, you might say, sophisticated? Joni: No, I don't think so. I don't know what it is about. Maybe it's just a myth and you look for it. Do you think that would be it? Because you're always told that Philadelphia audiences are going to be this way; maybe you just imagine that they are. I've had a double encore the other night that was really enthusiastic and I was very excited about it, whereas, in other rooms, it wouldn't be so exciting. It's more of a challenge to work to the people here. Ed: How long is your hair, Joni? Joni: Oh, wow, I couldn't really tell you. It's almost down to my waist but not quite. It's about three inches short of my waist. Ed: Joni has beautiful long blonde hair. It's been a pleasure talking with you tonight. Joni: Nice talking to you. They just flipped the lights so I guess it's time for me to go on. This article has been viewed 2,274 times since being added on September 29, 2015. While this may have later been aired on a WMMR retrospective, this is NOT a WMMR interview. It was recorded for WRTI-FM and aired on Ed Sciaky's "Broadside" program. I remember this interview well because I was there. I was the recording engineer. This is exquisite! Hailing originally from Philadelphia, I remember the late, great Ed Sciaky and The Second Fret very well. He was a terrific interviewer and always was tapped in to the talent of the time like no other DJ - his programming was proof of that. And the Second Fret was a hotbed of the best music around. How appropriate that Ed be the one to interview Ms. Joni. Musical genius meets programming master. Now, those were the days.....thanks for making this interview available. How special it is to hear Joni's voice from so many years ago. Sweet and smart. Being originally from Flint Michigan it was exciting to hear her talk about her love of the folks (and obviously there love for her) at a place called the Sipping Lizard. Her roots are my roots. There her music, her life is my life.